Older Women Heard, But Not Seen, In Vogue's "Age Issue"
Good idea: asking Vogue Editors in their 40s, 50s, and 60s to talk about their personal style for Vogue's "age(less) issue." Bad idea: having models in their teens and twenties "portray" said editors in the accompanying photo shoot. 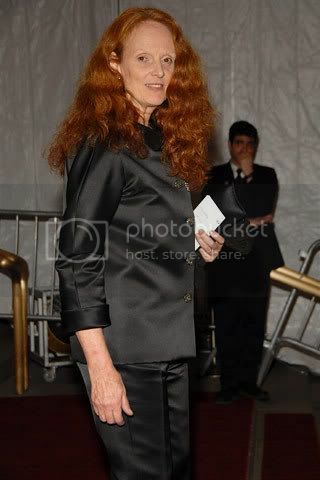 Karen Elson, at left, is playing creative director Grace Coddington, who, at 67 is looking pretty rad herself. Why didn't she — a former model — do her own photo shoot? Another shoot this month features actual older women, but these images of dewy young things dressed up as their elders undermine the issue's beauty-at-every-age message. More images — and cats! — after the jump. "Phew, I'm glad I'm not really in my forties" — twenty-three-year old Sasha Pivovarava plays fortysomething Elissa Santisi. This classy outfit (minus dorky earrings) would look great on fiftysomething Tonne Goodman. So why is seventeen-year-old Tanya Dziahieva wearing it? Criticism aside, Elson does look awesome as a cat lady in Converse. She can play me anytime.